I don't consider whaling a form of fishing - I'm not sure I even see the point - but this article (especially the pictures) are too crazy not to post. Make sure to click on the slideshow or video link at the bottom of the article as well. 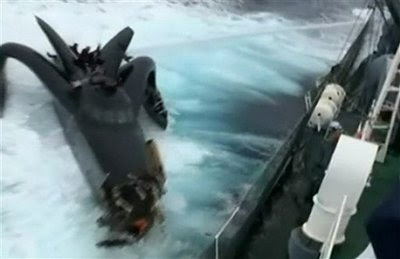 SYDNEY – A conservation group's boat had its bow sheared off and was taking on water Wednesday after it was struck by a Japanese whaling ship in the frigid waters of Antarctica, the group said. The boat's six crew members were safely transferred to another of the Sea Shepherd Conservation Society's vessels, the newly commissioned Bob Barker. The boat is named for the American game show host who donated $5 million to buy it. The clash was the most serious in the past several years, during which the Sea Shepherd has sent vessels into far-southern waters to try to harass the Japanese fleet into ceasing its annual whale hunt. Clashes using hand-thrown stink bombs, ropes meant to tangle propellers and high-tech sound equipment have been common in recent years, and crashes between ships have sometimes occurred. The society said its vessel Ady Gil — a high-tech speedboat that resembles a stealth bomber — was hit by the Japanese ship the Shonan Maru near Commonwealth Bay and had about 10 feet (three meters) of its bow knocked off. Now a few comments & a question. 1. 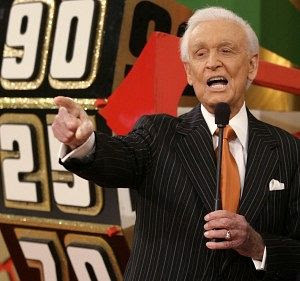 How cool is it that the "rescue ship" is named after Bob Barker? 2. Did you take a look at the boat that got jacked up? Is that some sort of alien craft or something? Better yet, where can I get one to take on smallmouth on the Schuylkill? 3. What do you think of all of this? Are these anti-whaling boats going "over the line" in the name of conservation? I think the anti-whalers are over doing it. But then, the whalers themselves might be over doing it. To me, there really isn't a need for commercial whaling. Subsistence whaling is another matter that I am all for.